descrizione: Gioco di 63 caselle numerate, spirale, orario, centripeto. "Het nieuw en vermaeckelyck ghanse-spel". Vedi esemplare conservato presso il Rijks Museum di Amsterdam. bibliografia: 1) LEESBERG, Marjolein: "El Juego Real de Cupido: a Spanish board game published in Antwerp, c. 1620." In: "Delineavit et Sculpsit" n°39, 2015. 2) BUIJNSTERS, P. J. - BUIJNSTERS-SMETS, Leontine: "PAPERTOYS. 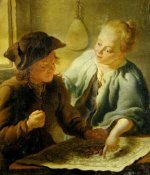 Speelprenten en papieren speelgoed in Nederland (1640-1920)". Waanders Uitgevers-Zwolle, 2005. 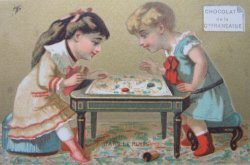 The Game of the Goose and the development of the printed board game. The Game of Cupid developed from the Game of the Goose, one of the most popular board games to this day. Both were games of chance and pursuit, played with two dice, on a track of sixty-three spaces with icons symbolizing advantages and hazards, a metaphor of the fortunes and fates during the path of life. By no means were they intended to be children’s games, as they were played with monetary stakes and fines. Although the Game of the Goose seems to have been played for centuries before, the earliest printed versions date from late-sixteenth-century Italy. A contemporary source, much quoted among historians of the game, claims that it was invented in Florence and pleased Francesco de’ Medici, Grand Duke of Tuscany, who went so far as to present an exemplar, probably a precious painted or inlay version, to Philip II of Spain, around 1576-’80. In 1585, Philip II’s court jester, Gonzalo de Liaño, complained in a letter to Francesco de’ Medici about the debts he had incurred due to a new game, called Game of the Goose, which was played in Tuscany and had been brought to Spain by the Medicean agent Luigi Dovara. 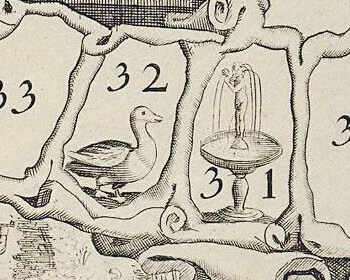 According to Carrera, the publication of the Game of the Goose in Spain inspired the invention of several closely related games such as the Filosofía Cortesana. A unique impression in the British Museum proves that the Filosofía Cortesana indeed existed as a copper engraving, published with a royal privilege in 1588 in Naples by Mario Cartaro. The inventor, Alonso de Barros, wrote an extensive description of the game, which was of a philosophical and didactive nature on fate and fortune of ambitious men at court. The lay-out of the game was clearly inspired by Italian impressions of the Game of the Goose such as an anonymous, possibly Venetian print of c. 1580-’85, the earliest impression of the Game of the Goose known to date. A Bolognese manuscript, written about 1585 by the scholar Ulisse Aldovrandi (1522-1605), contains the first known description of the game and its rules, including variants on the latter as played in Bologna. In 1595, the rules of the game were given in a Venetian song, ‘Il gioco dell’Occa’, by Giovanni Croce. The almost simultaneous appearance of printed board games and its rules seems to indicate a wider knowledge of the game. The Italian prints often have the title ‘new Game of the Goose’ [novo gioco de loca], apparently to distinguish them from an older version. In England ’the newe and most pleasant game of the Goose’ was entered in the Stationer’s Register on 16 June 1597 by John Wolfe, who had learned the trade of print publisher in Florence. However, no impressions of this game have been traced, only late-seventeenth-century English games of the goose in print are known. Nor is an impression known of a jeu de l’oye, mentioned in the inventory of the Parisian publisher Jean II de Gourmont (1535-1598). The earliest preserved French impression appeared c. 1600 in Lyon, in woodcut, published by the heirs of Benoît Rigaud. It differs from the Italian ones in lay-out, being of landscape format. 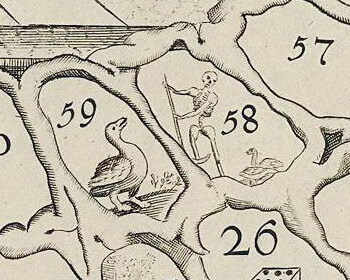 The title, printed with the rules in the central field, gives a puzzling clue to the history of the game: ‘Game of the Goose, renewed from the Greek’ [Le Jeu de l’Oye, renouvellé des Grecs]. Later French games keep referring to this undocumented Greek origin. The subtitle, ‘Game of much joy, as today it is practised by Princes and noble Lords’ [Jeu de grand plaisir, comme auiourd’huy Princes & grands Seigneur le practiquent], distinguishes this rather crude woodcut version from the elaborate ones, on marble or of inlaid wood and silver, played by royals and nobles. Obviously, the cheaper printed versions were meant to reach a much wider clientele. Despite, or maybe just because of the popularity of the game, only a few of these prints have been preserved. Most impressions will have been used up. The Game of the Goose soon reached the German courts as well. The Augsburg merchant, diplomat, and art agent Philipp Hainhofer (1578-1647), who had studied law in Siena and Padua, mentioned in his diary that ‘the true Game of the Goose […] as copper engraving, in Italy among the students […] was most common’. In his capacity of art agent he composed several curiosity or art cabinets, in which he included the game, e.g. in the cabinet of 1617 for Duke Philipp II of Pomerania in Stettin, a silver in ebony inlay, in a table of c. 1628 for Magdalene Sybille of Prussia, Electress of Saxony in Dresden, and in the cabinet, presented in 1632 by the city of Augsburg to King Gustav Adolph of Sweden. The latter two games are printed impressions, pasted onto a marble board and hand-painted, both of landscape format and especially the Swedish one is inspired by Italian boards. Otherwise, all three have one specific feature: the addition of a drinking cup on space 61, not found in any of its European predecessors. 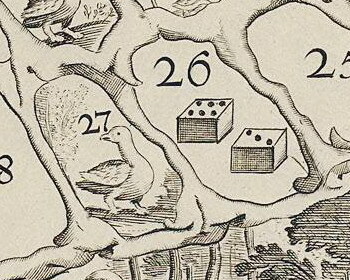 Although this hazard seems to have its origin in the German cultural realm, it is not mentioned in the rules of the Game of the Goose, as written in 1616 by Duke August of Braunschweig-Lüneburg, who was also provided with this game board by Hainhofer. The board game was known about 1600 in the Dutch Republic. In 1602-’03 the famous jurist and prodigy Hugo de Groot (1583-1645) wrote a number of playful epigrams on household objects, the Instrumentum Domesticum, which were published in the collection of his early poetry. One of these distychs is a moralizing poem on ’The Game of the Goose: Be it by various lot, nevertheless we are bound for the same goal, and death dashes all our wishes: who said it is just a game?’. In 1619, when he was arrested and imprisoned in Loevestein Castle, an inventory was made of Hugo de Groot’s goods. No Game of the Goose, however, is mentioned among the confiscated goods nor among the items his wife was allowed to take with her. By 1624, the game must have been well known in Amsterdam as it was mentioned by Jan Jansz. Starter in his Steeckboecxken, in which he described a game he invented for the ‘young at heart’ as an alternative for ‘cards, checkers, game of the goose [gansbort], and others’. The first known Dutch impression in print of the Game of the Goose was published in Amsterdam by Claes Jansz. Visscher, and has been dated to 1625-’40. In the lower margin the title and rules are engraved. 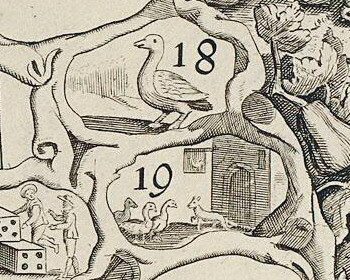 Similar to the Italian and English boards it is called ‘the new and pleasant game of the goose’ [Het nieuw en vermaeckelyck ghanse-spel]. The origin of the design of the game is unknown but it is more elaborate and inventive than any of its predecessors. The track is set against a landscape background with amorous couples in each corner and an elegant company, drinking and making music, at centre. In the background of each scene a smaller couple alludes to the five senses. 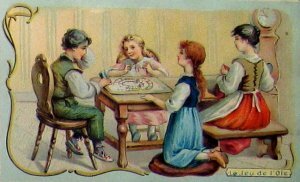 The landscape format and clockwise spiralling track, as opposed to the classic Italian anticlockwise versions, follows the German impression of the Game of the Goose, known from the table of Magdalene Sybille of Prussia in Dresden. 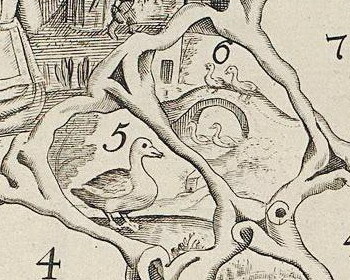 Another similarity between this board and Visscher’s is the addition of the drinking cup on space 61, which can also be seen in a printed German Game of the Goose with the same lay-out in landscape format and clockwise spiraling track, published in Cologne by Martin Fritz about 1650. 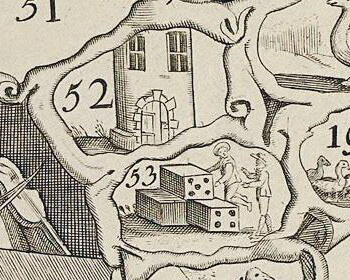 Strangely, this hazard is not explained in Visscher’s rules whereas the German game does describe it: ‘when someone arrives at 61 where the glass stands [he] has to make a toast’ [wan aber einer auf 61 kompt da daß glaß stehet muß ein trunck thun]. Claes Jansz. 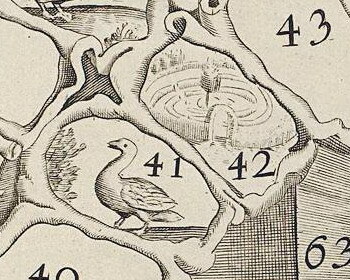 Visscher must have based his Game of the Goose on a German example rather than the Italian or French ones. However, his is the only Dutch game with the drinking cup; in later versions it is absent while it continued to appear in German ones. The earliest Game of the Goose that we know of from the Southern Netherlands seems to be a woodcut made and published in Antwerp by Jan Christoffel Jegher (1618-1666), about 1650, although it has only survived in a reprint of c. 1713-’17. 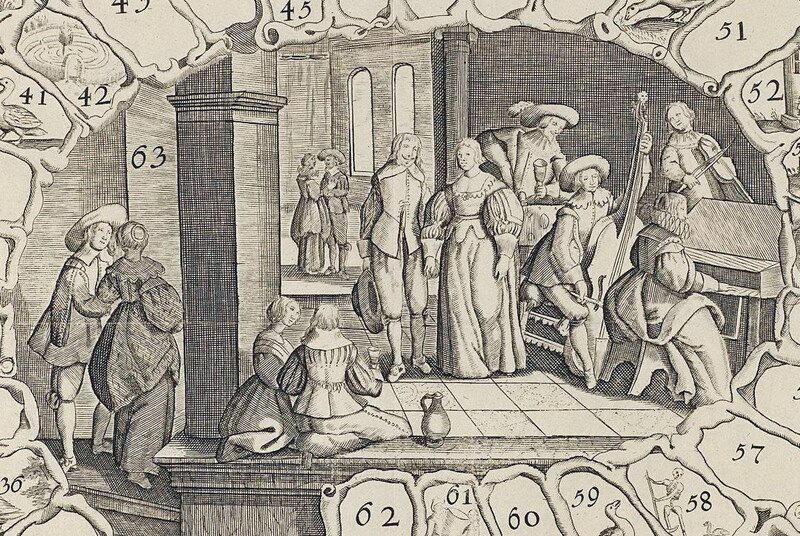 Except for the title and landscape format it has little in common with Visscher’s engraving; the lay-out is based on the classic Italian board. A woodcut copy in reverse was published by Philippus Jacobus Brepols as late as c. 1834-’36. 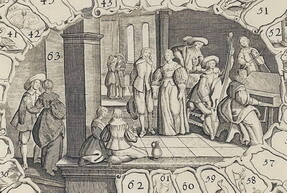 Whereas Visscher’s board, judging by its refinement and central scene, aimed at a market of upper class merchants and aristocrats, the central scene in Jeghers’s woodcut refers to an inn or even a brothel, with two men playing backgammon while being distracted by women and robbed from their purses. Jeghers made a second, somewhat cruder woodcut of the game in standing format, which apparenty aimed at an even larger market. The woodblock ended up in Amsterdam, where it was still being reprinted in the mid-eighteenth century and later even copied, about 1770. Both Claes Jansz. 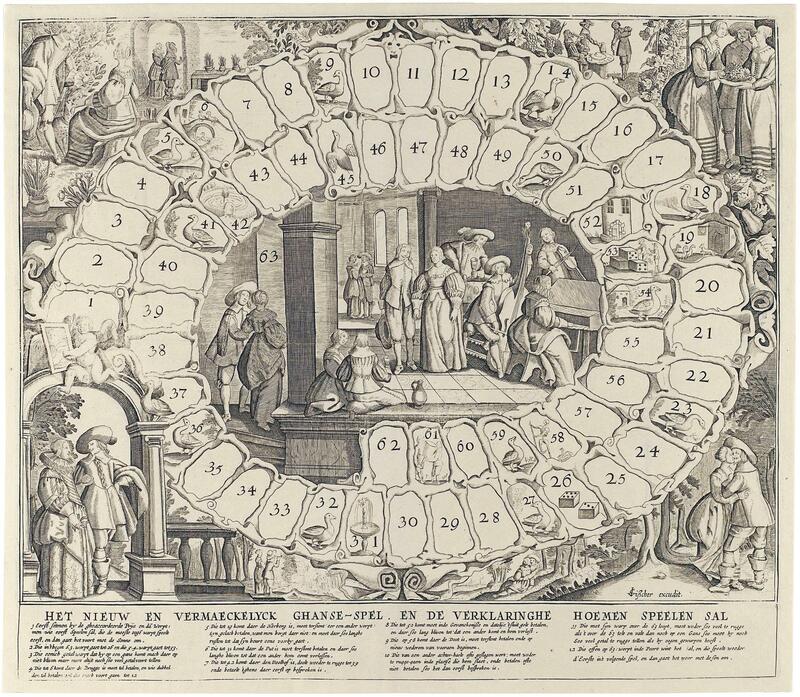 Visscher and Jan Jeghers published another board game that had originated in Italy and became popular in the Netherlands, the Game of the Owl or ‘plucking the owl’ [Pela il Chiù]. This game does not have a spiralling track with sixty-three spaces but four oval or circular tracks, two with images of three dice, two with allegorical images.